This card is probably the best tank in the game because of it’s high hp and the fact that it is air. It simply terrorizes your opponent when you drop it on the map. The lavahound is super slow so it will allow you to build troops behind it. The baby dragon attacks both air and ground. It does splash damage to all nearby units. It is good against skeleton armies, minion hordes, minions, goblin army, etc. It is also pretty tank for a card that is only 4 elixir. Similar to the building Inferno Tower – it’s a Dragon that does exponentially increasing damage. Its only weaknesses are its relatively low HP and it targets anything (not only buildings). The benefit of the dragon over the inferno tower is that it is cheaper and is mobile. One of the best and most unique cards in the game. It is a wise investment to spend 6 Elixir to get more Elixir back. Its weakness is that it is vulnerable to spells and some other cards such as the Miner, the Hog Rider, etc. However, it’s the fundamental card for this deck – as you need lots of Elixir for a good push. 3 Minions for 3 Elixir. A pretty trade. If they are protected by the Lava Hound, they can do some good damage and they can also help protect the Lava Hound as well. Despite the recent nerf of the card, Zap is still one of the best cards in the game. It can take out the Skeleton Army, reset Sparky, Inferno Tower, etc. It’s fundamental that you should also have a defending building in your deck. In this case, it’s Cannon. You can also use other towers, but we want to try to keep our elixir low. This card is used to defend against many cards and wipe out any large army. It is important that you wait until your elixir is ALMOST full because there is a delay when you summon the lava hound. You want to plant it behind the 2 towers to give it room to build up. If you have a Lava Hound and don’t see reaction from your opponent, drop the Lava Hound on the furthest corner (opposite to the side that has Elixir Collector). Wait for it to reach the Bridge and drop either Baby Dragon or Minions, depends on what you have at that time. Shortly after that, drop the Inferno Dragon. The main counter for the lavahound is the inferno tower, so it is important to zap it 2-3 seconds into it’s attack. Your two dragons can defend pretty well against most units. Make sure to take advantage of the elixir advantage. If you drop the elixir collector and are able to counter most of his units while using less elixir, you will most likely win the game. Keep pumping out as much elixir collections as you can if you see that your opponent cannot counter them. This deck will most likely take out all three crown towers. 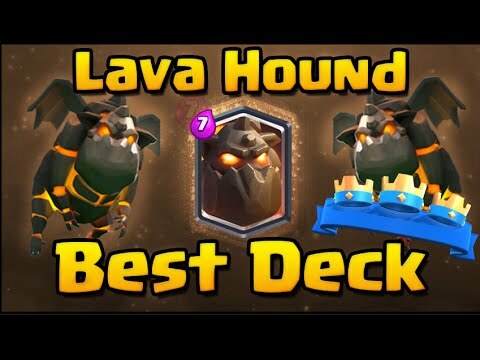 Aside from the inferno tower as a weakness, people like to send units down the other because the lava hound is extremely slow. You want to watch out for elite barbarians and hog riders. It is important to have minions or cannon in hand to lure them to the little so they can take damage. The fire spirits is actually the best card to stop most counter units as it can do high splash damage. Do not use the Inferno Dragon by itself unless it is for defense. It’s low hp makes it vulnerable to many units. Don’t be too arrogant. Make sure to save enough elixir to protect a counter. 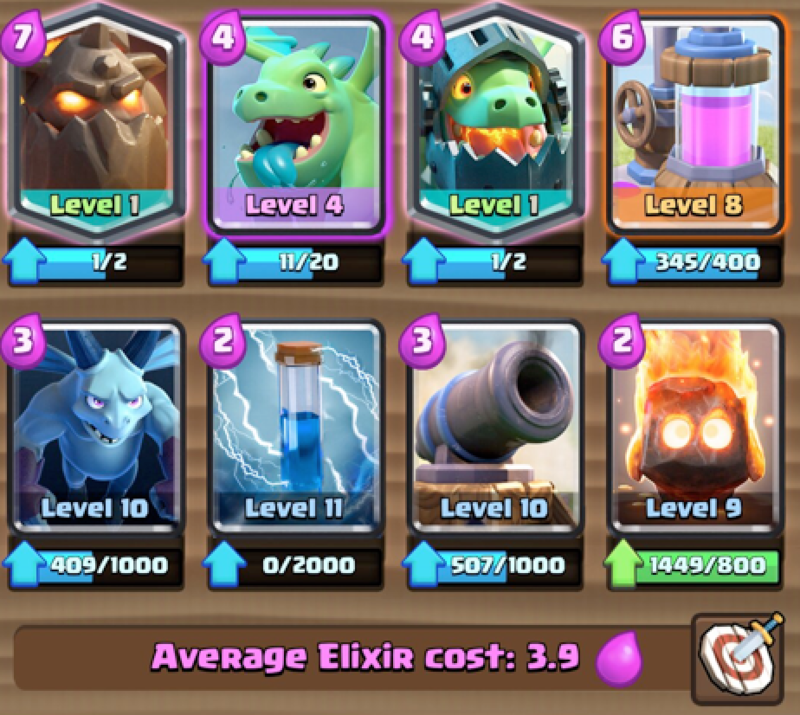 Always plant the Lava Hound to the furthest back so Elixir has some time to reproduce – and you will be able to cope it with the 2 dragons. Clash Royale Clan Battle Is Live!